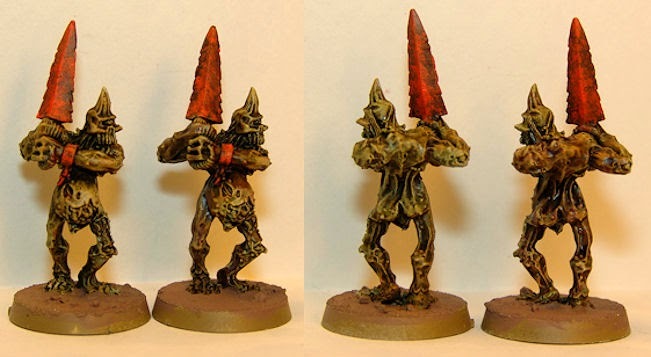 A lil' Rednekk step-by-step : Plaguebearers. Usually I have a hard time remembering how I paint something after the fact when someone asks, so I tried a little experiment with the Plaguebearer production line. Since there are multiples of the same model it lends itself pretty good to a step-by-step thing, so I took some notes and here's what I come up with .. in case you wanted to know how I got them nasty lookin' critters done. They were primed with British Military Brown, then washed with Army Painter Quickshade (strong tone). 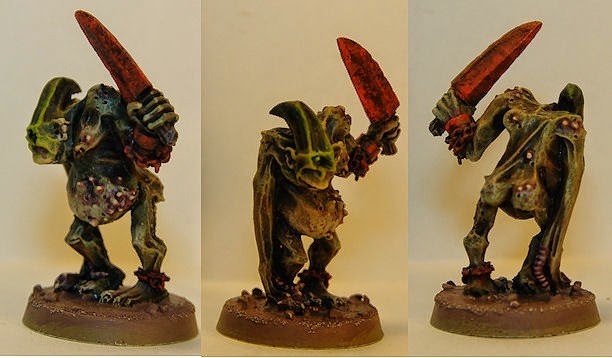 After that was a quick drybrush with GW Rakarth Flesh and some Bleached Bone on some of the spots, I wanted better highlights like the bellies, elbows etc. I then washed the whole model with GW Althonian Camoshade- a favorite of mine for my Chaos army. 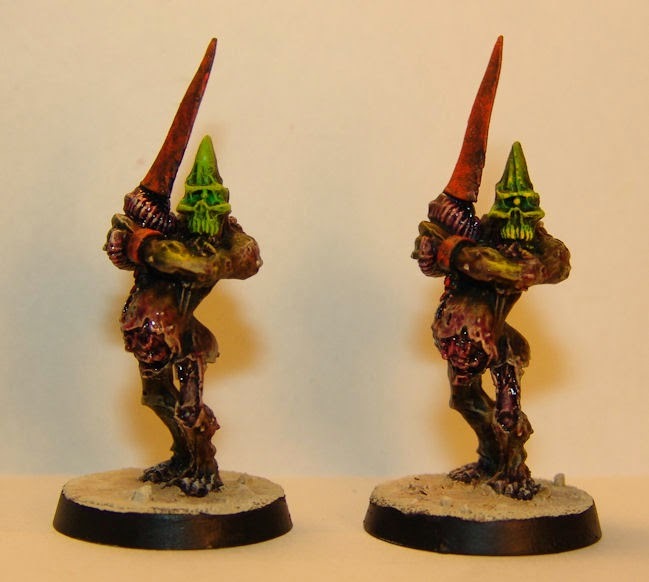 After that, a quick drubrush on the highlighted areas with a mix of GW Rotting Flesh and Elf Flesh. One could probably paint the open wounds with the flesh colors and wash them brownish red and call it tabletop and be happy.....but I like to paint too much. That's where we start our merry journey.... the guy on the left in the picture below. We'll call him Step Zero (not counting how I did the rusty sword). 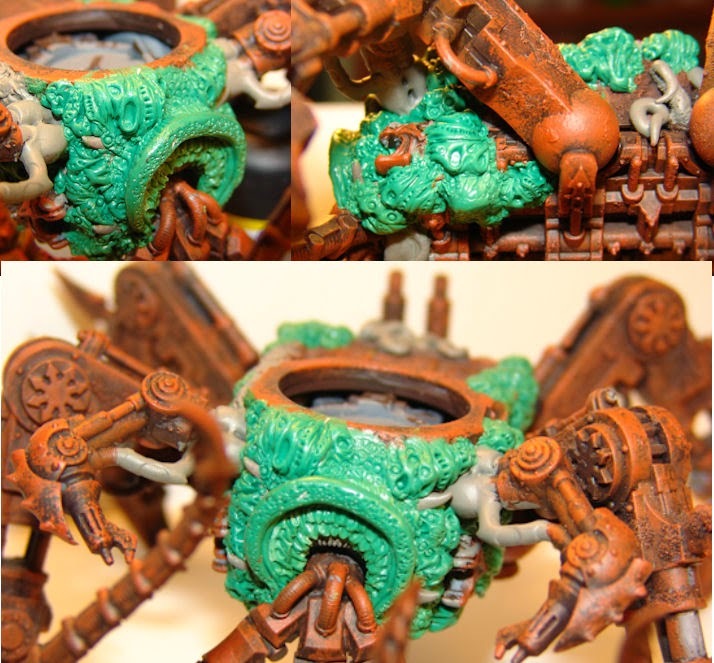 Here's a tutorial I did a while back on a quick and easy way to do cool rusty stuff! STEP 3: 2b is on the left now. I have drybrushes of all sizes and I take small ones with GW Elf Flesh again to hit the skin edges, gently just to bring them out a bit. A small brush with the Reaper Polished Bone to catch the toes and exposed bone edged, even make thin line or two. Then a very light drybrush on the exposed skull. All those shadows that were deepened with Violet are hit again with GW Althonian Camoshade. 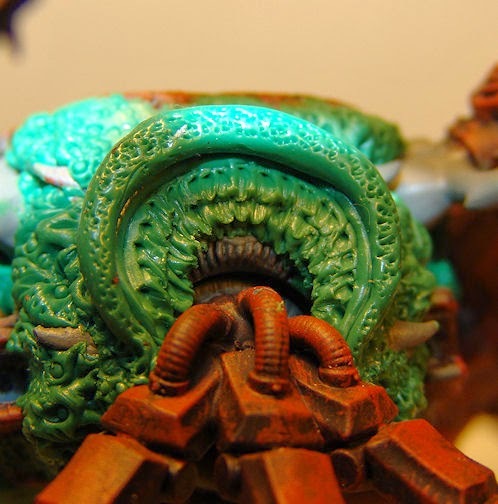 The zit/pustule heads and the upper edges of the tentacle fingers are touched with Reaper Golden Flesh Highlight. GW Gloss Varnish on the open body cavities and stippled around some of the grosser areas for ewwwy goooeyness. I put in the sand color for the dry grassland bases, which will contrast nicely with the models. Its always nice if your model doesn't totally blend into your base, especially if you spent some time painting it. STEP 4. The Warp Glowy Eye Thing. I use P3 Ioson Green, Necrtite Green and Cygnus Yellow. 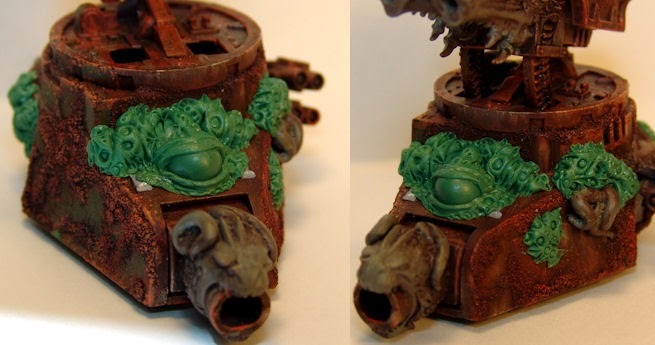 A little Ioson Green/Necrotite 50/50 mix for a base in the eye cavity. 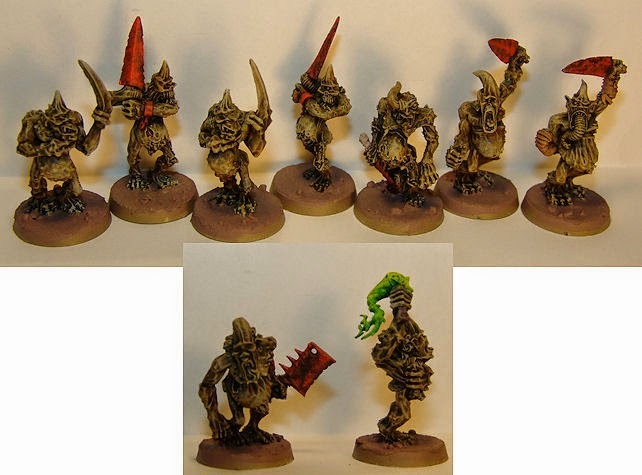 Then the Necrotite drybrushed around the areas I want to "glow". I mix that with a little Yellow, drybrush the areas I want brighter. Then mix with a little more straight Yellow and repeat. Note a little refection on the elbow. Finally, a touch up with straight yellow. A dot on the eye, some stippling on the eye brows and edges of the teeth. You'll never guess what's next.... OK, it was easy. 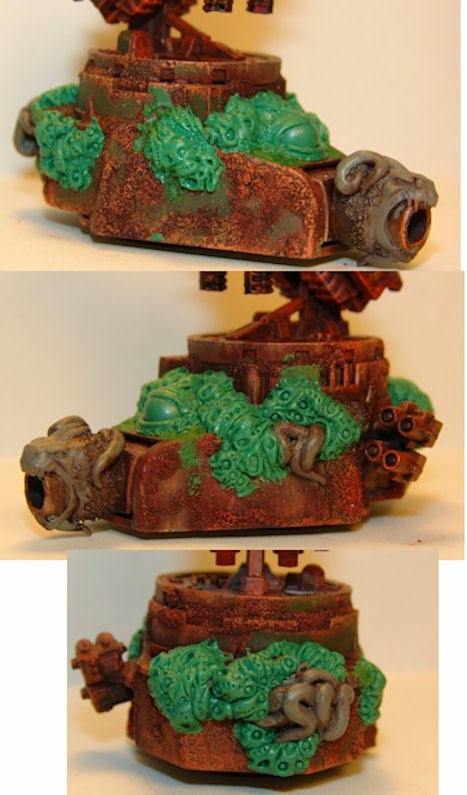 GW Althonian Camoshade. A light wash or stipple along the edges to make it more subtle and bring out the definition. I paint my base edges black. Eventually, there will be some static grass and or dried leaves, maybe even some corruption where the feet touch, but for now that's done. Overall (including stopping to take pictures and take the dog out) it was a bit over 2 hours work to complete 2. That's all for now. Hopefully, this unit will be done this week and I can move on to building something, which I'm itching to do. My mom bought me my first model kit - the USS Missouri- I believe in 1976. So, I've been building models for a while. I have no idea how many I've built. It started with ships, then planes, then tanks. After college I even joined the IPMS (International Plastic Modellers Society) chapter in Syracuse NY and competed in many regional shows, organized events and judged models. Bumping into the Warhammer 40,000 hobby in college in 1991 was a great excuse to play with my models... just like I did as a kid. And 20-odd years later, I'm still at it. 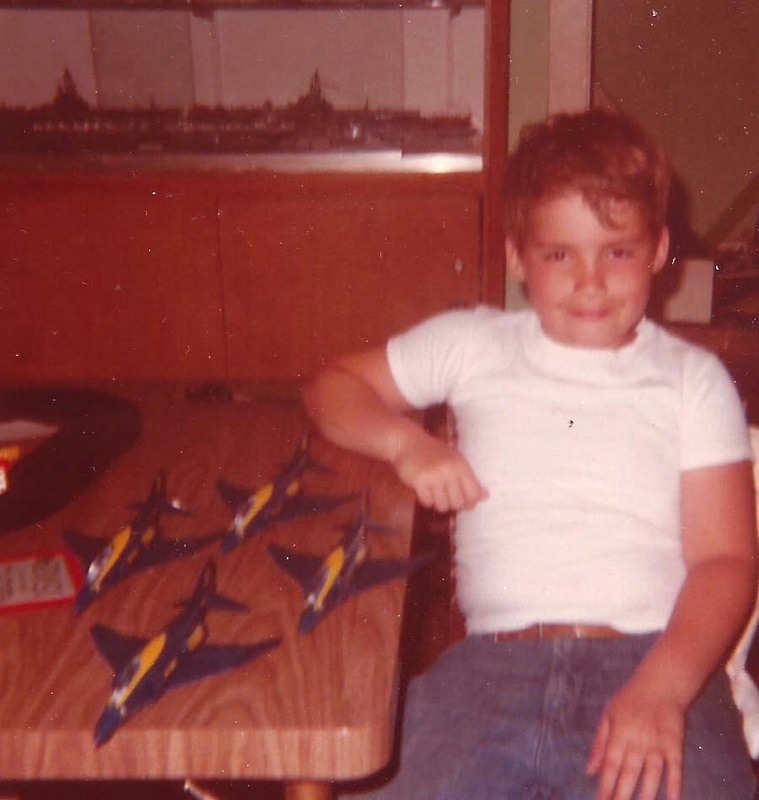 And proudly displaying a successful decal application on the Blue Angels.. back when they flew F4 Phantoms. Note the carrier fleet in the case in the background. 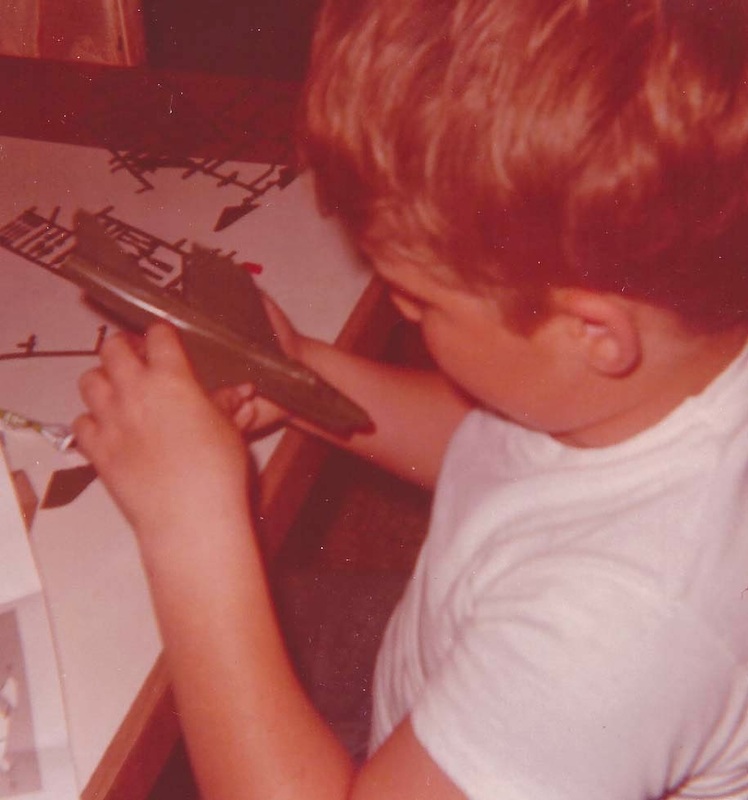 So one of the reasons for my nostalgia comes in part from digging up old photos to post on Facebook, but it also reminds me that I've been doing this for a long time and a great deal of model building is second nature to me at this point. My wife pointed out over dinner the other night that it'd probably be good for me to do some posts about hobby basics, since not everyone who reads this blog has been building models for 30+ years. And she's probably right. I may not be THE authority, but It did inspire me to begin work on a few "Da Rednekk's Modelbuilding 101" posts which I'll be dropping into the mix... just to share the way I've learned to do things. Its not the ONLY way to do things, but its the things I've learned over time and I hope you like them. In other news I've spent most of this week trashing...er,uh.. organizing my hobby room (its amazing how much garbage you can aquire) and I'm pretty much back in shape to paint and build again. More progress on my metal plaguebearers to post around the weekend. And I have to say I'm wound pretty friggin tight about the new ORK codex! I did an inventory on my ork army and its likely there will be Orks mixed in with the Chaos stuff I'm working on. New comics coming online soon at Da Comixshop too. Lots to do. Not-So-Smilin' Bob might almost be smilin'. Maybe. In the meantime, I'm continuing work on the older metal Plaguebearers. I love all the plasctic kits these days, especially from a converters point of view, but the many of the old metal sculpts definitely have a charm to them. The Plaguebearer I chose to make my Champion is one of those guys. Lots of cool gribby bits on this guy. I'm thinking I'll use these guys as freshly summoned deamons, so that's what the glowing green eye and head thing is about.....plus, its just a bit different. I may add some stuff to the bases eventually, dried leaves or the like. While working on these guys I'm using a LOT of overlapping washes and I got to thinking about blood and various nastiness. I may just have to do a tutorial post or two on that kind of thing. Hmmmm. ORKS ARE COMING! I'm one happy Warboss! I'll be dusting the boys off this week and doing some inventory. I already have my Codex and Data cards ordered with my LGS and we;ll see what we need from there. Also, for those that seen it, you'll soon find out why Orks would attack hippie music festivals "Da Rednekk Skwadron" #2 is in the pencil stage (yes, I'm an old fart... I still work with pen and paper) Its going to be a fun summer. I'm excited. And I know its hard to tell from the pictures above, but so is Bob. Just a quick note on a change I made to my other languishing blog. It had been intended to be used for one creative project, but I've decided just to use it for all non-hobby related creative things- comics (mostly) some writing, artwork, sketches, etc. The URL has changed and I have yet to post anything new, though I will in the next couple days. I DID re-post a comic that I posted here- "Da Rednekk Skwadron #1" That will be their home from now on over there...well, there and on board their carrier. Oh, wait until you see the carrier. If you want to check out the archives and such or just bookmark it for the future, here's the New Komixshop! Pictures of some finished plaguebearers and the finished workup on Not-so-Smilin Bob should be up late tomorrow night, so stay tuned. A few more details and then, Bob gets some new paint. Speaking of new paint on old models.... 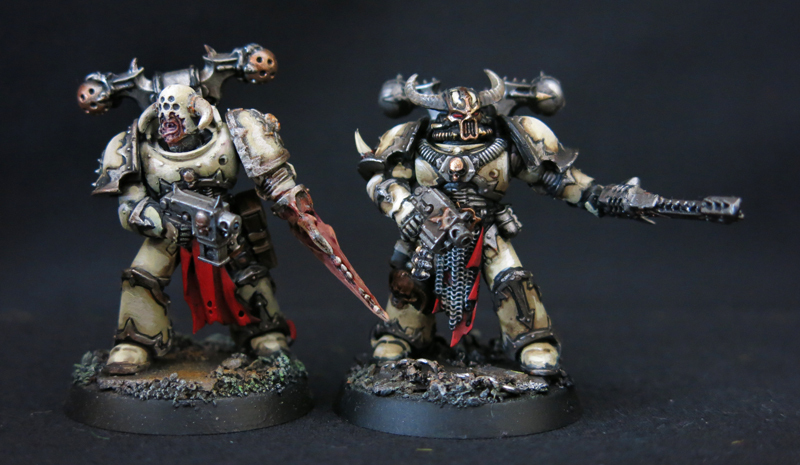 I figured I'd get the old metal plaguebearers painted. One is done and 9 are in progress..